Compact and sturdy, the Patterdale Terrier's chest is smaller than that of most Terriers. 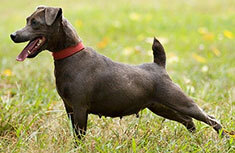 The Patterdale Terrier's tail is long and is used to pull out the dog when it has wedged its way too deep. 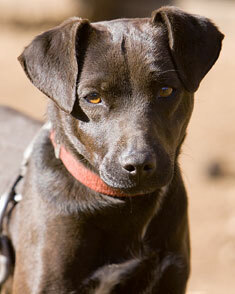 The Patterdale Terrier's ears hang down in V-shaped folds. The Patterdale Terrier originated in England. Patterdale Terriers are about 12 inches (30 cm) high. Patterdale Terriers weigh 11 to 13 pounds (5 - 6 kg). Patterdale Terriers are usually black, however other colors include red, liver (with a red nose), grizzle, black & tan, and bronze. The Patterdale Terrier's coat is short and coarse or wiry and requires little grooming. Though small in stature, the Patterdale Terrier is tough and makes an excellent watchdog. This independent breed isn't as yappy as some of his other Terrier cousins and enjoys curling up beside a warm heater. Patterdale Terriers are not easy to obedience train and should not be trusted with non-canine pets. The expected life span of the Patterdale Terrier is 11 to 13 years. Patterdale Terriers are not recommended for apartment living. They do best living in kennels with other Patterdale Terriers and should be ensured ample exercise and activity or they will otherwise grow bored and pick fights with their kennel mates. This breed loves to run and hike and is happiest when it has game to pursue. Find Patterdale Terrier Puppies with our Free Breeder search!